* Installation of commercial Heating, Cooling and Ventilation systems in new construction and existing structures, as well as retro-fits and system replacements. 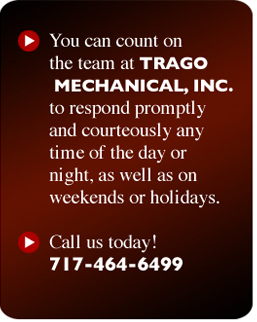 * Service Agreements – Trago Mechanical, Inc. offers agreements with which we guarantee 1-4 maintenance services each year depending on your individual needs. * Food Service Equipment Installation and Maintenance. * Having a regularly scheduled service will help prevent expensive breakdowns by finding damaged or worn parts and replacing/ repairing them before a total shut-down of equipment occurs. * A service agreement also helps keep your equipment clean so it runs more efficiently, therefore keeping utility costs down. * Customers having a service agreement receive priority status during regular business hours as well as after hours for any problems that occur between scheduled services.